The drag system utilises eight independent contact points to produce the smoothest and most dependable drag system on the market today. Two square inches of carbon fiber drag surface results in unsurpassed stopping power and heat dissipation. The spool fits on a carbon fibre stabiliser with two fully sealed stainless steel ball bearings that provide precision fit and smooth rotation. The Ross™ F1™ employs a Ross original clutch bearing The extensive use of carbon fibre in the drag system, produces strength and rigidity, while at the same time reducing overall weight. Ten separate o-rings completely seal the system, making it totally impervious to the drag-changing effects of water. The Ross™ F1™ employs a constant-torque drag knob with a 56:1 mechanical advantage, resulting in uniform drag knob rotation and infinite drag adjustment. • Lifetime warranty to first purchaser. 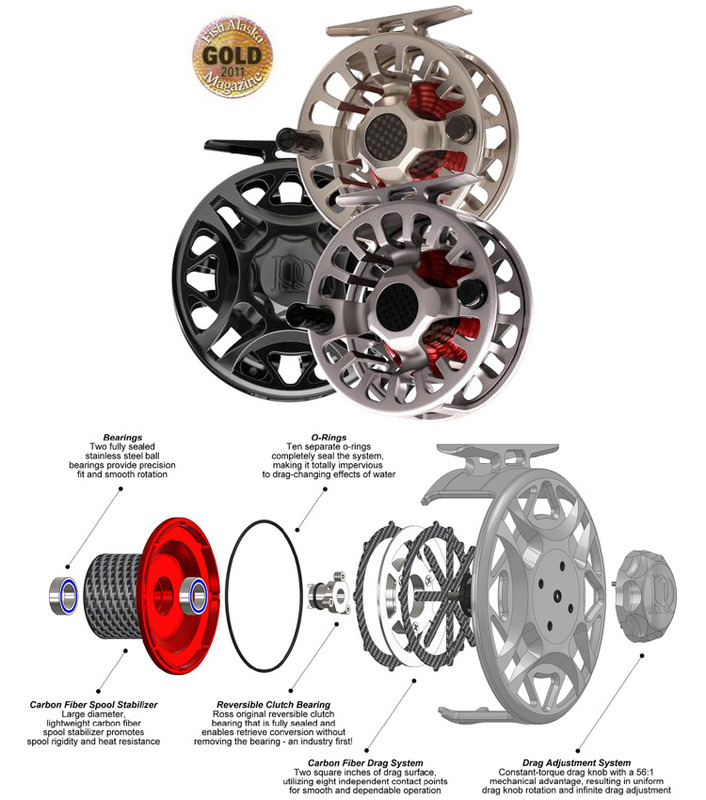 This entry was posted in Fly Fishing, Reels, Rivers, Salt Water, Stillwater, Tackle Reviews and tagged bonefish, fly fishing reel, Fly Reel, flyreel, game, Ross, salmon, saltwater, stillwater, trout by fftcouk. Bookmark the permalink.